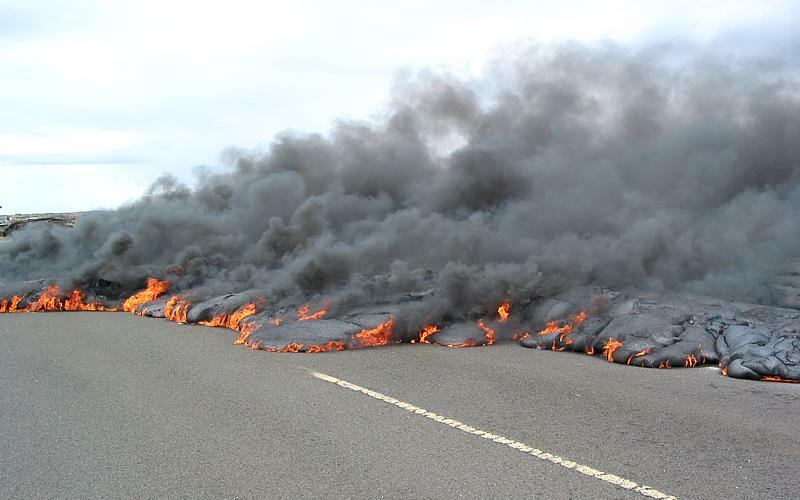 About three dozen photos in this part cover roads and highways downhill from the Kilauea volcano on Hawaii's Big Island, which are or used to be closed by that volcano's lava flows. 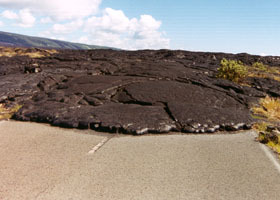 Lava flows from the Kilauea volcano, beginning in 1986, closed part of the Chain of Craters Road in Hawaii Volcanoes National Park, and two connecting highways to what had been a coastal entrance to the park, state route 130 from Pahoa, and county route 137 (the "Red Road") running along the coast from Kapoho to Kalapana. 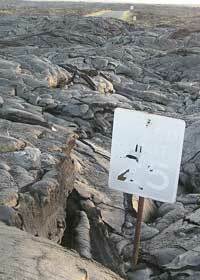 A different part of Chain of Craters Road was closed by lava flows in 1969-1974. For daily updates on what Kilauea's up to (constantly changing, no guarantee you'll get to see a show like I saw -- but you might get to see something better), check in with the Hawaii Volcano Observatory, including its Kilauea eruption update. 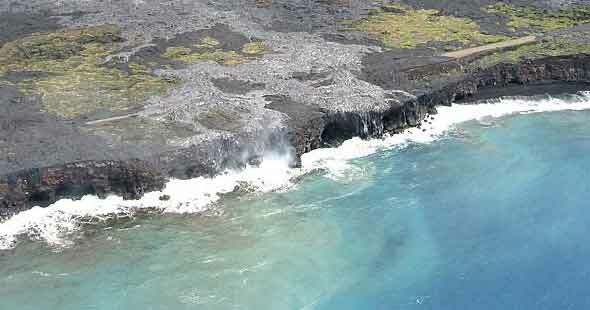 Its excellent web site has photos of current volcanic activity, and also lots of interesting information on Kilauea and the Big Island's other volcanoes (including the much larger but currently quiet Mauna Loa). Cautions? Nah, not really. 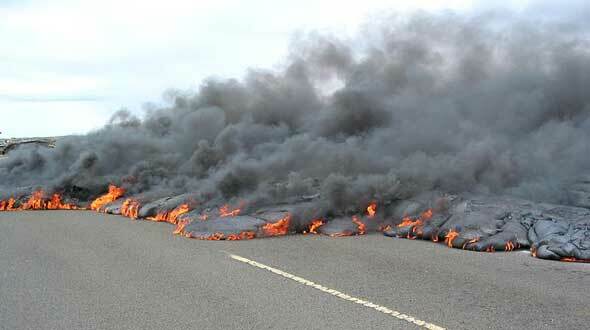 Those of you asking hesitantly "there must be 50 ways to leave your lava . . . r-r-r-right?" needn't worry (even though there are few escape routes, as you can see from the map below). 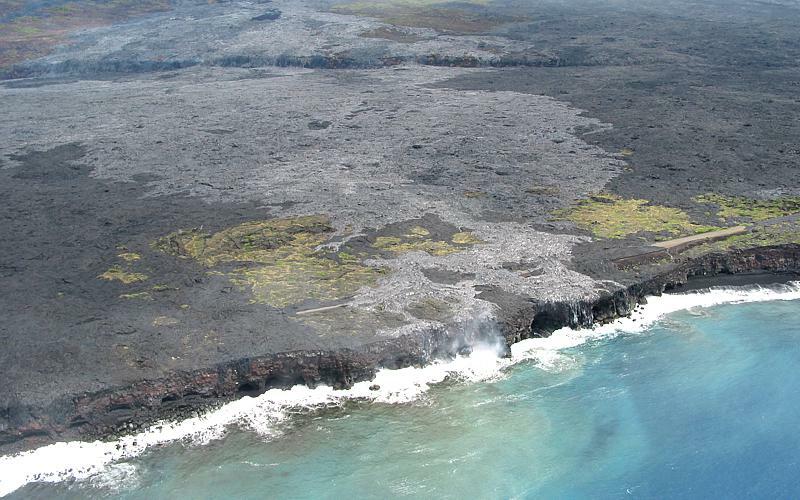 Kilauea is very closely watched by the Hawaii Volcano Observatory. 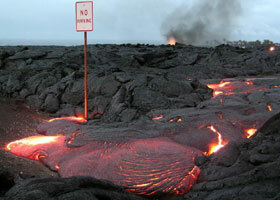 It also has very slow-moving lava flows (no faster than slow walking speed). 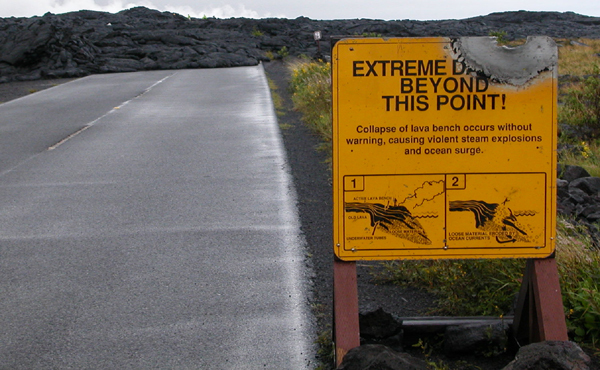 So if you're on a road that hasn't been closed to traffic, it is extremely unlikely that the volcano will catch you by surprise. 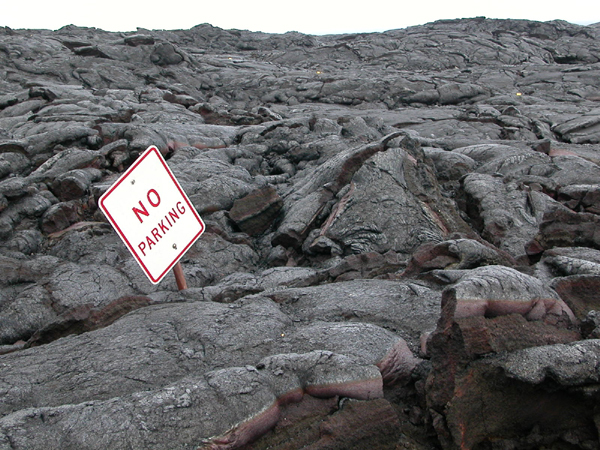 If you do hike off-road, in search of better lava viewing spots, do read and heed the signs placed at trailheads, telling you how to safely view the lava (you'll need good shoes, long pants, water, and a flashlight if darkness is approaching, among other things), as well as all the interesting ways you can die if you disregard the instructions. This part of the road photos collection is divided into two pages. 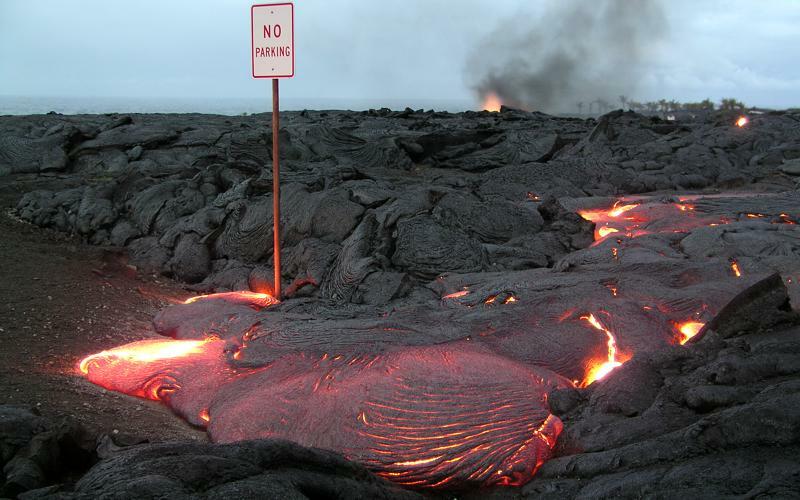 The 13 photos below on this page cover lava closures of Chain of Craters Road, and other lava flows, in Hawaii Volcanoes National Park. 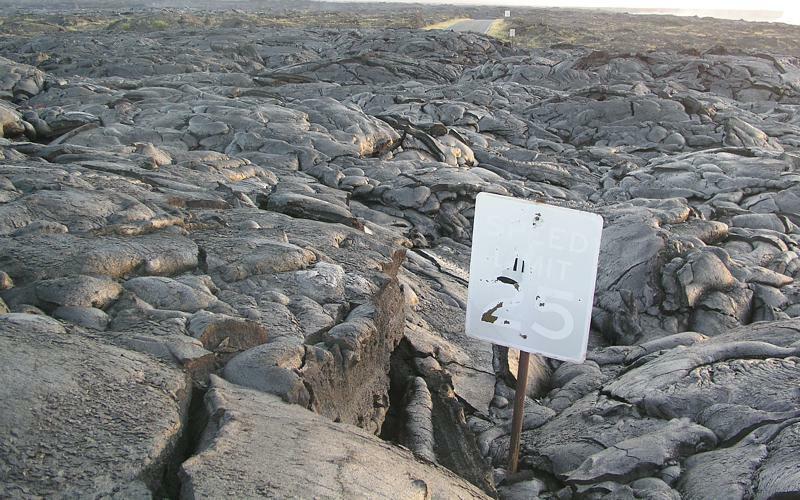 Page 2 covers lava closures of roads east of the park, and also the unpaved access road (briefly converted into the "Kalapana Safe Viewing" toll road, and recently reopened to the general public) built over the old state route 130 right of way. Notes: Many of the photos below came from the extensive photo archives of the Hawaii Volcano Observatory's Kilauea eruption update. Those photos have "HVO" in their captions, and are courtesy of the U.S. Department of the Interior, U.S. Geological Survey. 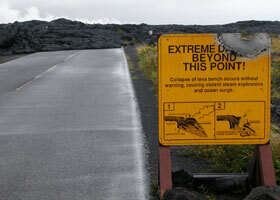 Two are courtesy of Tim Reichard, from his visit to the Big Island in January 2005. 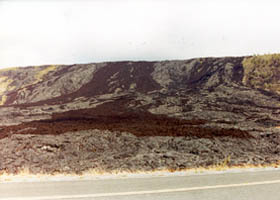 The remaining photos are my own, from my 1999 tour of Chain of Craters Road in the national park, and 2000 and 2001 lava-viewing visits from east of the national park. In case you want more detail, clicking some of the photos below (for now, just a few from my 2000 trip, more from my 2001 trip, and Tim Reichard's photos, plus some of the HVO photos) will call up enlarged, higher-quality (less .jpg compression) versions. Those alternate versions have larger file sizes, so please be patient while they download. 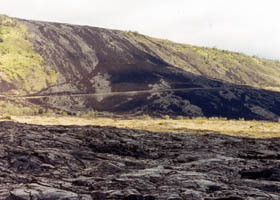 As of October 1999, this was the closure point where the lava had "resurfaced" Chain of Craters Road, in a series of flows ending in 1997. 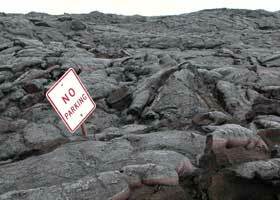 As shown below, later lava flows have shortened the road a little more. © 1999-2003, 2005, 2008 Oscar Voss (no copyright claimed on HVO photos, which are in the public domain). Last updated March 9, 2008.